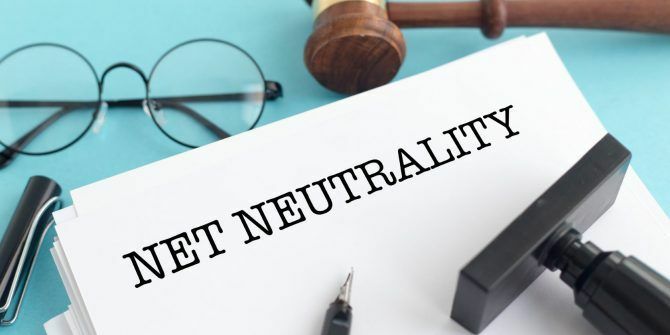 Net neutrality in the United States is under attack again How the Web Won on Net Neutrality: 5 Key Moments How the Web Won on Net Neutrality: 5 Key Moments It does looks like net neutrality will reign, at least for a while. Let's take a look back at some of the most important moments in this battle. Read More . The FCC is planning to vote on whether to repeal net neutrality policies on Thursday, December 14. Before that day comes, it’s critical to let your representatives know that you want to keep the internet free and open as it is now. Net neutrality is the principle that all traffic on the internet should be treated equally. With net neutrality in place, internet service providers (ISPs) like Comcast and Verizon cannot give special treatment to certain kinds of traffic (e.g. slower speeds for Netflix or YouTube streams while faster speeds for their own streaming services). Net neutrality allows the internet to be a level playing field. You can read our full explanation of net neutrality What Is Net Neutrality & Why Should I Care? What Is Net Neutrality & Why Should I Care? A significant number see Net Neutrality as essential to the survival of the Internet. In this article, we're going to look at why Net Neutrality matters, and why we should fight to protect it. Read More for more info. Without net neutrality, ISPs would be free to create “package deals” or “slow lanes” for sites that didn’t pay for the privilege of being fast. For instance, your basic Comcast internet plan could include access to MSNBC’s website (which Comcast owns), but charge you $5/month extra to visit any other news site. You’ll see promoted tweets and videos from ISPs claiming that they support net neutrality. Do not believe them Will ISPs Help Protect Net Neutrality? Spoiler Alert: No Will ISPs Help Protect Net Neutrality? Spoiler Alert: No There are claims that net neutrality could soon be taking a big hit in the United States. Is this true? What's going to happen to net neutrality? Are ISPs on our side or not? Read More ! They are liars, and their actions show it. Since the FCC, and not the public, is voting on this repeal, you can’t do anything directly. However, you can still make your voice heard by contacting your members of Congress. Using the EFF’s simple tool, you just need to enter your address and it will generate a letter to your representatives for you. You can customize the letter if you like, but the standard one works too. After you enter your address, you’ll need to provide your name, email address, salutation, and county in some cases. You may also need to specify a topic for the correspondence — telecommunications or something like it is your best bet. How have you fought in favor of net neutrality? Share your thoughts in the comments! "Net neutrality is the principle that all traffic on the internet should be treated equally"
The vast majority of the data I would classify as communication. The last time we had such a rule affecting communication was The Fairness Doctrine which was overturned on constitutional grounds. Kind of ironic claiming that Net Neutrality is needed to protect the "free Internet" considering Net Neutrality rules are responsible for shutting down free Internet access in India and Egypt. Here in the US the FCC has warned AT&T, T-Mobile and Comcast that offering free data violates net neutrality. "Net Neutrality" isn't just protecting from blocking access to sites by ISPs; it's also about treating all data fairly, and not giving a "free ride" to preferred partners or one's own businesses (AT&T and DirecTV's streaming site, for example); it means playing *no* favorites. It sounds great in theory but it's not so great in reality. Imagine if we applied these principles to parcel delivery. No first class mail, no priority mail...all mail travels at the same speed as advertising flyers. And the reason Netflix loves net neutrality is because it means every else subsidizes their high bandwidth usage. Netflix **already** pays Comcast and others for bandwidth. They also offer free "co-location" (paying to put their hardware in data centers) for anyone who wants it. It makes no sense to penalize streaming companies by charging them extra when ISPs are ALREADY being paid by THEIR CUSTOMERS. Charging Hulu or YouTube ON TOP OF THAT is "double-dipping," and is MASSIVELY damaging; imagine your bank putting a stamp on your monthly statement...then having to pay the postman AGAIN when you receive the letter? Net Neutrality is less about "who gets paid" than by discriminating against data bandwidth; what would happen if Comcast (which owns NBC/Universal) decided to slow Time Warner's streaming apps to a crawl to promote their own offerings? I've paid for access to ALL the Internet, at the best speeds my ISP can manage, WITHOUT anyone interfering with it or deciding what I can or can't do; why pay for 60MBits/sec and have Hulu or Netflix arbitrarily slowed down to 480p when I can watch YouTube at 1080p? THAT'S Net Neutrality - not who pays for it (I already do!) - and "violating" it means favoring one site over another. No way! It's funny that we hear all this talk about how the ISPs are supposedly slowing bandwidth but it was actually Netflix that got caught throttling video for AT&T and Verizon users. And yet the Net Neutrality rules won't apply to Netflix...only to ISPs. How convenient. I get what you mean, but I don't think this analogy is correct. In your mail example, the upload/download speeds you pay your ISP is equivalent to first class/priority/media mail. If you only pay for 5 megs down, you can expect a slow experience. Likewise, if you pay for media mail, your package takes forever to arrive. The lack of net neutrality applied to the mail would mean that the post office opens up your packages, checks what's inside, and decides when it will be delivered based on its contents. This doesn't happen.